Welcome to my stop on the Sun blog tour. I’m absolutely delighted to be the final part of this exciting tour, and the posts have been exceptionally brilliant, from fantastic picnic food, to brilliant reviews and Q&As! 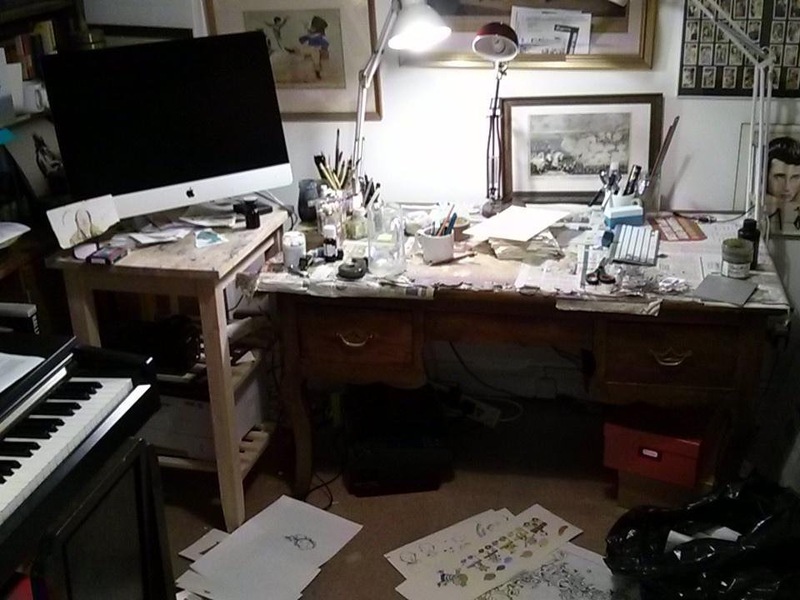 Today, I welcome the very amazing author and illustrator Sam Usher onto Book Monsters to give us a sneaky peak around his work space, it’s like invited stalking. And like his books, it’s quite an adventure! 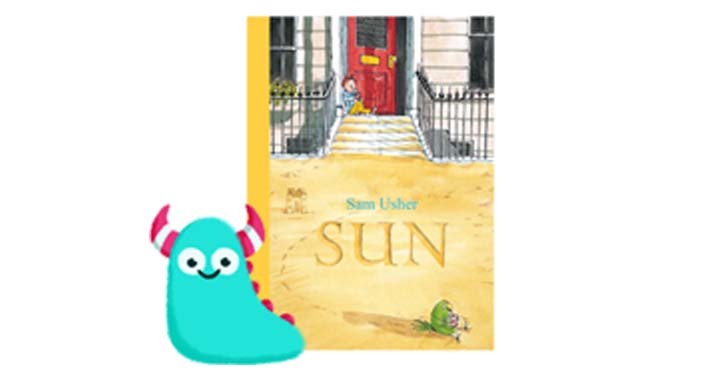 But first we’ll take a little look at Sam’s newest book, Sun, published by Templar Publishing. Sun is the third title in Sam Usher’s seasonal series, which has included Rain and Snow and sold over 70,000 copies to date. There’s a good reason why these books are selling so well, they are simply gorgeous. Sun is no exception, from the off we have a beautiful quality publication, made with thick matt paper, and sparkle embossing on the cover to represent the glint of the sunshine, it has a lovely overall feel. Inside, the story is even better, it’s something every child can identify with. A bright, hot sunny day, and the want to explore. Told from the child’s perspective, we follow him as he gathers supplies, and goes out into the scorching sun with his beloved Grandad to explore the world and find adventures. This is an endearing sweet tale, and shows an unbreakable and adorable bond between Grandfather and Grandson which will warm the cockles of your heart, just like that sun which beats down. However, the humanness of this story doesn’t mean it has to be boring, as later on in the book, the two adventurers come across pirates, whether real, or imaginary, we’ll let you decide, but it throws in an element of excitement and fun for children reading this book, and I know MANY children who love pirates! 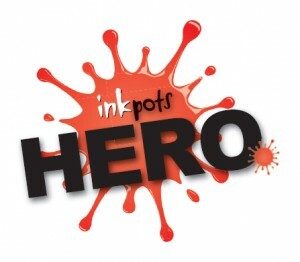 It’s the perfect combination of relatable story and imaginative adventure. Sam’s illustrations are vibrant, full of depth and colour, so much so, you can almost feel the heat bursting out from each page! The end illustrations of the pirates are exciting and fun, packed with details for children to delve into. From an educational perspective, Sun, and the other books in this series, have a lot to offer. Discussions about seasons, the weather and relationships can all stem from this one story. 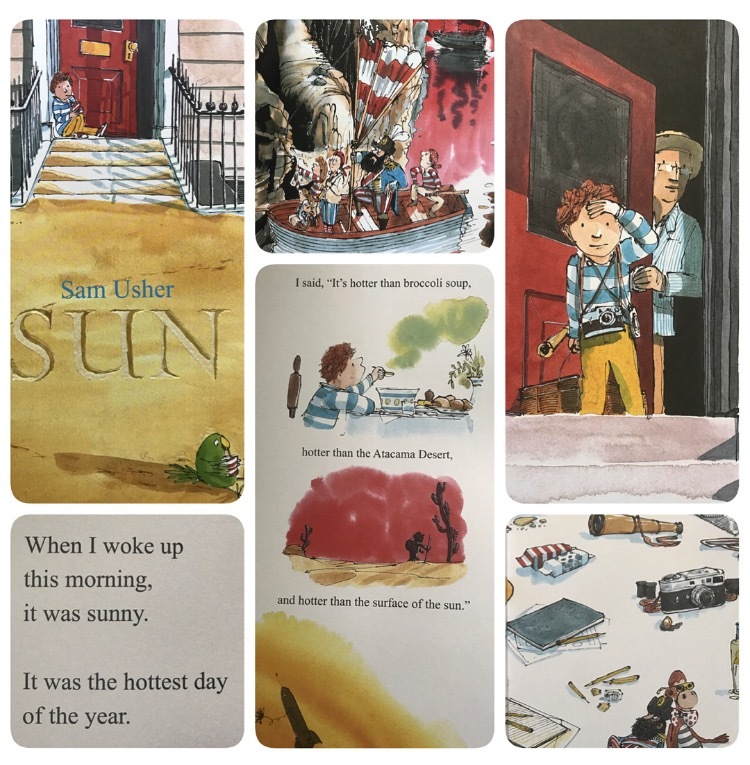 It contains repetition to engage and interest younger children in the story, and it would be a great launchpad for older children’s own creative writing (the weather is hot, what adventure would you have? What would you take? Where would you go? What would you find?). A great book also, to encourage children away from computers and into the outdoors, to walk and explore the world around them, enticing them with the promise of adventures and interesting stories to tell. This is a rounded book, perfect for any setting and situation, great to read out loud to children, but perfectly accessible and simple enough for a child to look at and understand on their own. Great work Sam Usher and Templar Publishing! Sun is now available from all good bookshops and libraries, so please grab a copy of this sparkling bright read! Now, I happily pass over to Sam himself, who has been kind enough to share with us, photos and details of his, various, studio spaces. Big Book Monster thanks to Sam for giving us this fascinating little insight. After living for 5 years in one place – London – I thought it’d be fun to have an adventure and try out working in different countries. 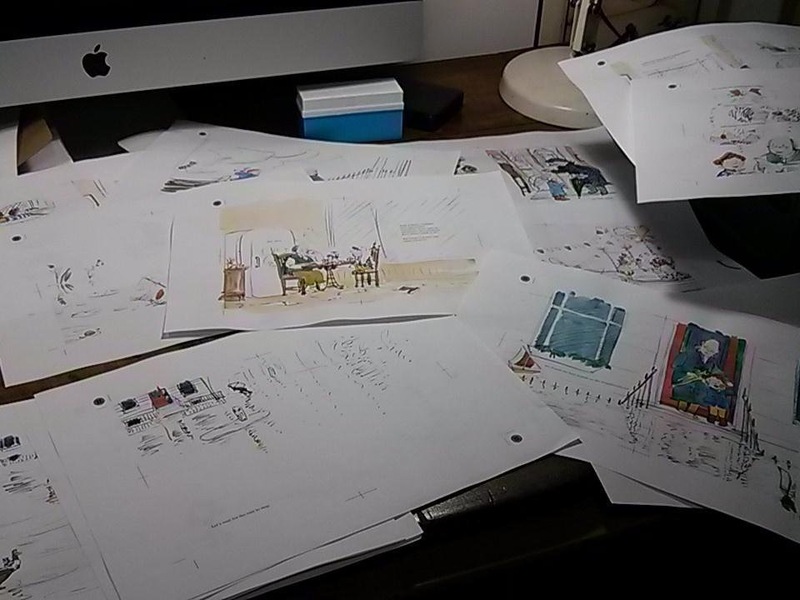 But first of all, here is my desk that I used to work on RAIN and SNOW. It’s terribly messy, but that’s ok. 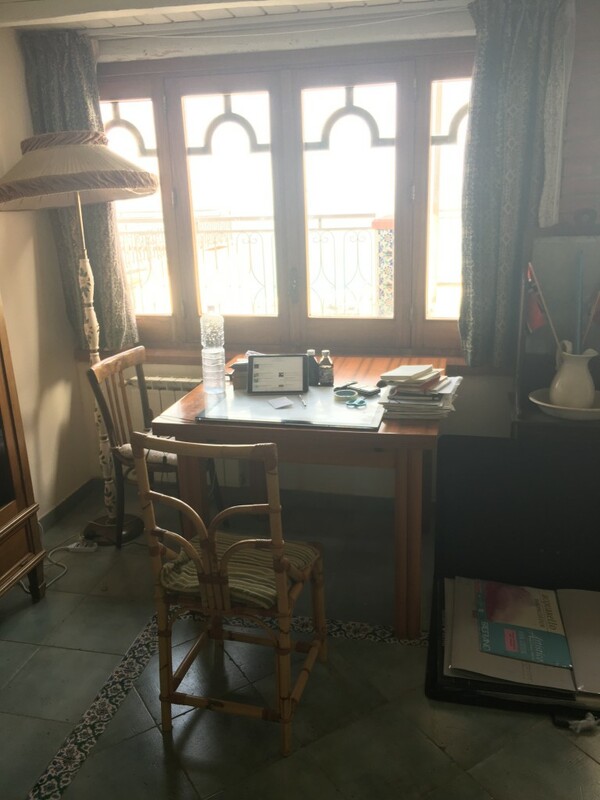 The first stop on my adventure was INDIA – This is the room I did my drawing in. 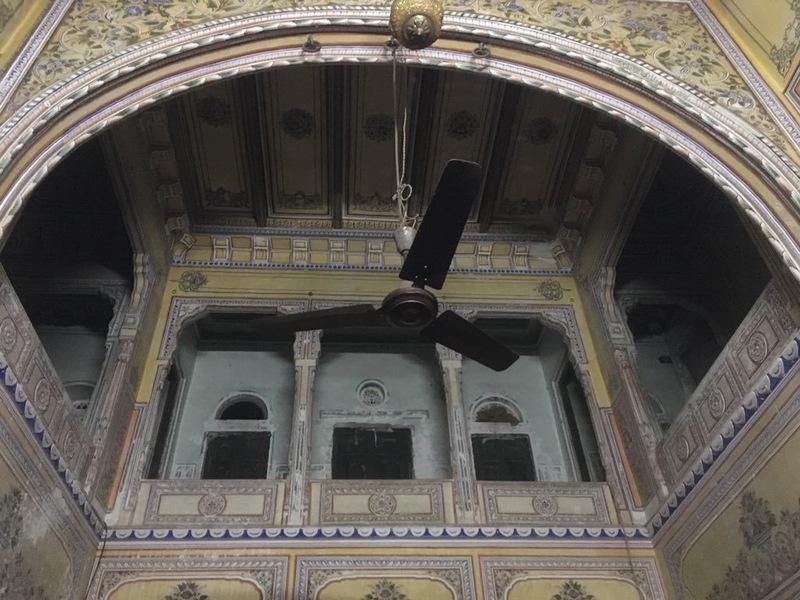 It’s at the top of a castle in a village in Rajasthan. I wonder who had visited this room. It was hundreds of years old. 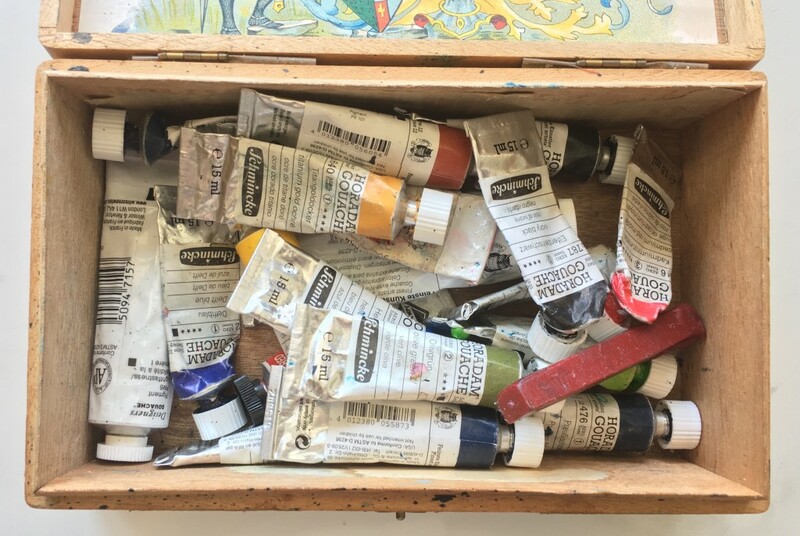 These are my paints – I take them everywhere – but I had to throw a few out when I went through airport security. On reflection, I should have thrown away my toothpaste. After India, I decided to go to Sicily. This is my desk in Modica – a small town in the south of the island that looks like a wedding cake and smells of oranges. 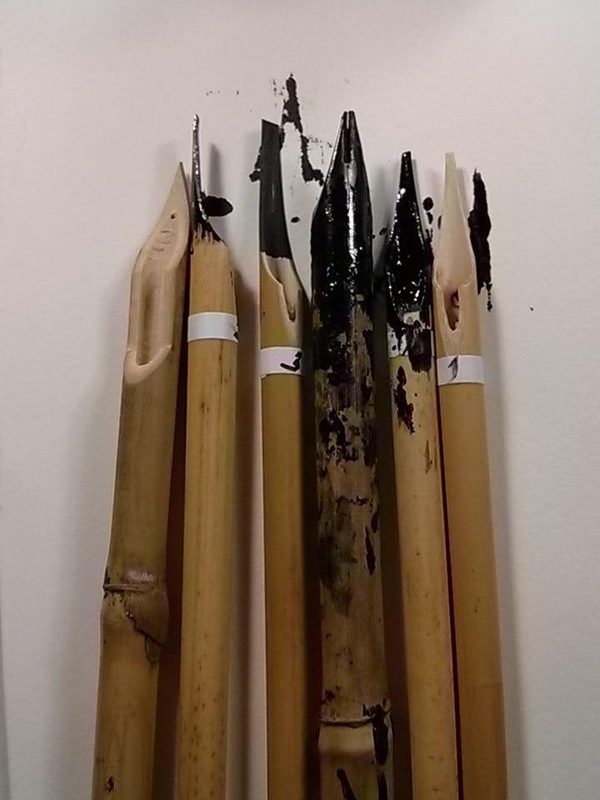 I use these pens whenever I need to do thick wobbly lines – they’re made of bamboo. Here is another desk. Is this boring now? It was in a very boring town, but I got lots of work done. 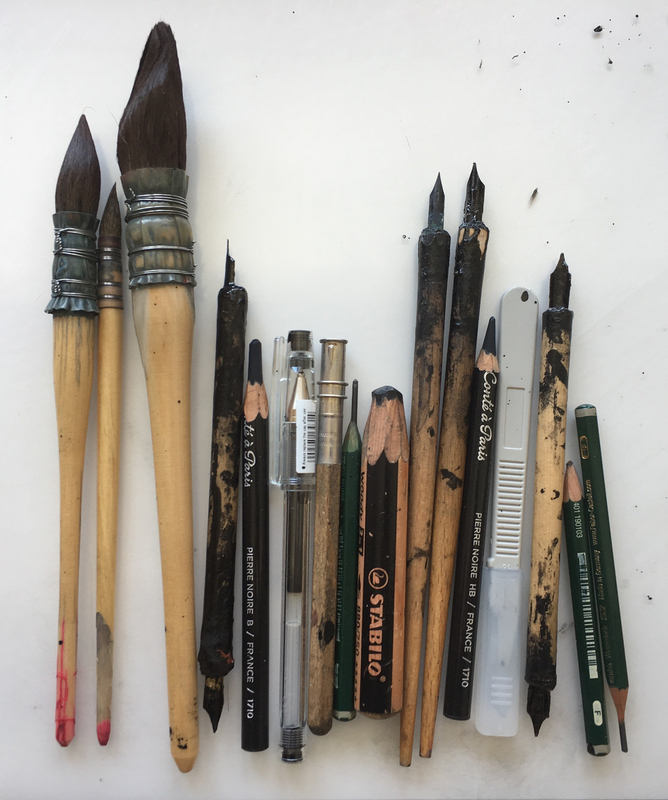 These are my precious brushes and pens. They’re old and covered in ink but very precious. 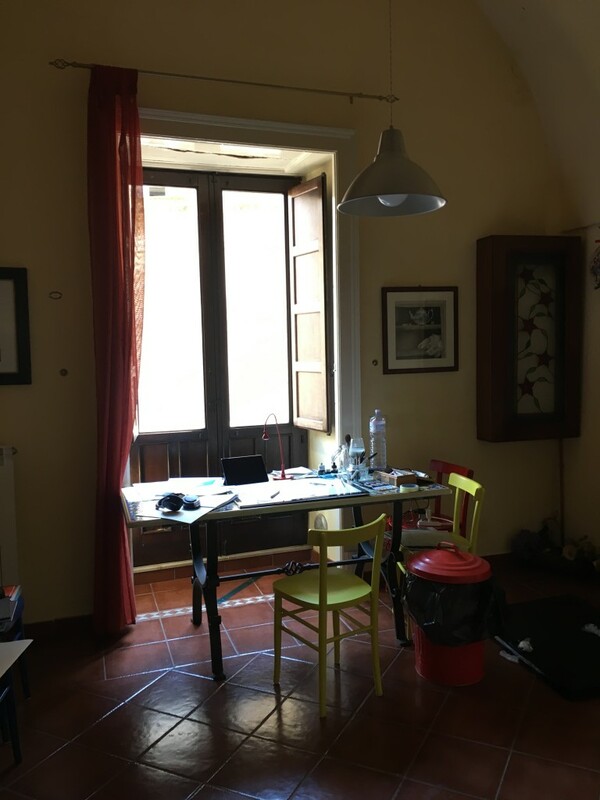 This is the final desk on my Sicilian adventure – there’s nothing interesting to say about this workspace, apart from the fact that I rarely used it as I was often distracted by the ice cream stands and brioche buns. I didn’t get much work done and became obese. And there you have it! 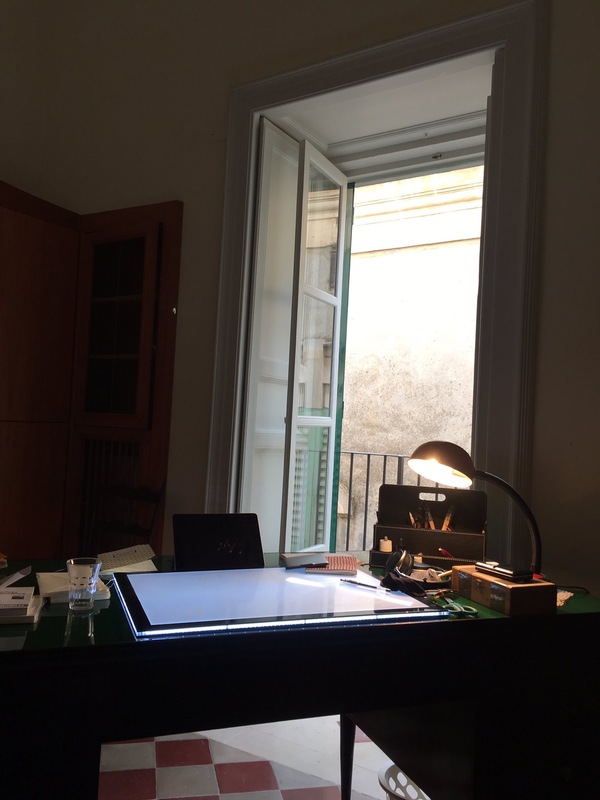 A well travelled author/illustrator. Huge thanks again to Sam for inspiring us with his work space, and his gorgeous book, Sun! 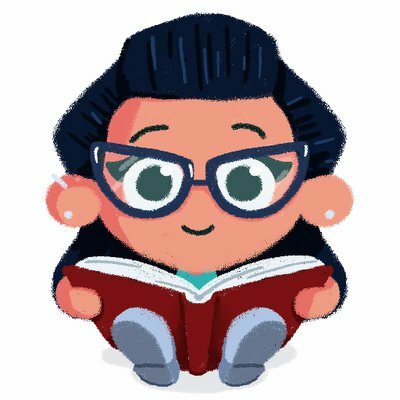 Thank you for reading this sunny Book Monster review.